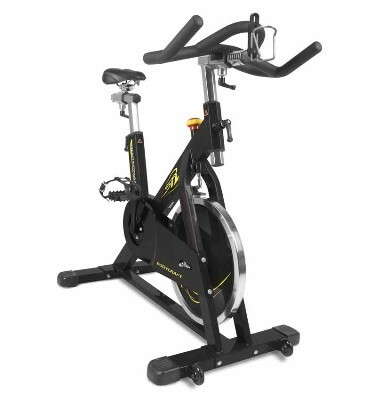 Bodycraft SPL Indoor Cycle is an ind0or upright exercise bike superbly constructed with a heavy duty steel frame and automotive grade drive belt. It has a max weight capacity of 300 lbs and a demension of 43"L x 24"W x 47"H with comfortable seats to provide swiftness to your workout. It is among one of the finest exercise bikes today. It has some amazing features like heavy flywheel, lightweight pedals, Friction Brake with Micro adjust Knob and Cro-Moly Heat Treated Axle. Frame: Zinc coated high tensile steel with 2 powder coat paint. Flywheel: 31 LB Precision Flywheel is perimeter weighted for high inertia and spins on German made SKFTM sealed bearings. Cranks: Three-piece cold forged steel, 175mm long. Pedals Lightweight 9/16” aluminum alloy pedals with toe straps (can be switched to SPD’s). Dimensions: 43″L x 24″W x 47″H. Seat Post & Handlebar Stem: Hexagonal shaped stainless steel with micro-adjustments. Bottom Bracket: Cro-Moly Heat Treated Axle with Quality SKF Sealed Roller Bearings . Water Bottle Holders: Two water bottle holders included. Drive: Maintenance-Free French made Hutchinson™ 5PK V-ribbed automotive belt. Resistance: Friction Brake with Micro adjust Knob & Emergency Stop. Residential Warranty: Lifetime frame, 2 years parts ( 90 days on wear parts ) . *Note: Most of the sites, stores or shopping portals listed above sell Bodycraft SPL Indoor Cycle Exercise Bike with discounts and other exciting offers. There is a possibility that the some of above websites are not selling Bodycraft SPL Indoor Cycle Exercise Bike now. Toughtrain.com is not liable for such cases or instances. Also we do not recommend any seller for Bodycraft SPL Indoor Cycle Exercise Bike and a buyer should buy from where he/she gets best deal with quality of products, service and on time delivery (shipment).